The custom 2006 Big Dog K9 Chopper for sale is a 2006 Big Dog Mastiff SS 117 Chopper that has diamond cut heads, a diamond cut air filter housing a beautiful fire red paint color and stripes from the front to the back of this powerful motorcycle that was meticulously built for speed and performance. 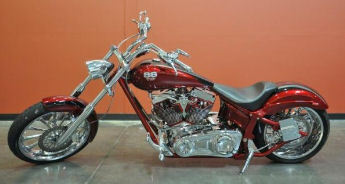 You have to ride it and see the depth of the multi-stage custom paint job to appreciate the richness of the red color. This bike with its blasting, two cylinder 1956cc engine has no lack of power and every part and accessory included in the build of this chopper has been extremely well taken care for every one of the 4492 miles that it has been ridden and enjoyed. You must see the Big Dog for yourself to understand why I say that it is one of the most unique choppers in the Northwest USA. If you have any questions regarding the Mastiff or if you would like to make an appointment to see it in person or make payment and pick up you can do so using the space below that has been provided by Strike Lightning's GoGoCycles Used Motorcycles for Sale and PLEASE do not neglect to include your contact information in your email or to provide a phone number or email address so that I can respond with answers to your questions or set up an appointment as quickly as possible. In my opinion there is not a better deal on a custom chopper for sale as this Big Dog Mastiff in Portland Oregon OR, on Craigslist or in an Ebay auction so hurry and make an offer before this beauty gets away from you! Strike Lightning would also encourage our biker friends to write a review of the Big Dog K9 Chopper or share any thoughts and/or opinions to make potential buyers aware of any problems that are commonly associated with this brand or to highlight its positive features and help our visitors make informed decisions. The price on this powerhouse is a very very cheap $16,995 so email before it's gone and don't forget to mention that you found this ad on Strike Lightning's Motorcycle Classifieds www.gogocycles.com using the comments forms located on this page.